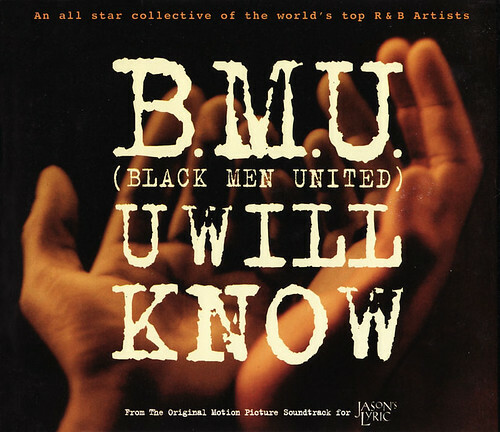 Black Men United was a 'supergroup' made up of R. Kelly, Boyz II Men, Tony Toni Tone, Tevin Campbell, Usher and more (including Lenny Kravitz on guitar! ), apparently formed just for this track, in order to promote the film Jason's Lyric. Jason Alexander: I've never flown in a plane before. Lyric: Sometimes you don't need a plane to fly. Jason Alexander: Damn, it's quiet out here! I should've brought my radio. Lyric: [smiling] No, it's not quiet. It's full of music. Just listen. And talking about music, the B.M.U. track U Will Know came with sterling remixes from C.J. Mackintosh, including two house mixes that were very cleverly constructed, skilfully layering element on element. This really reminds of the time when Mackintosh was dishing out what he called FXTC dubs with generally superlative results (Sounds of Blackness, for example), and I never tire of listening to the track, 15 years later. classic house and i´ll hear for a long time...precious track. Congratulations for the mix.